Not many things are as intrusive or meddling as an overactive bladder (also known as urgency incontinence). So, when your elderly loved one starts having urinary urgency issues (an overactive bladder), it might be time to come up with effective, healthy strategies so that they can continue to live their life. Without a plan, all activities in a previously vigorous routine would have to be canceled or changed on the fly in order to account for limiting factors like the proximity of bathrooms. Simple things like going to an unfamiliar place may cause great anxiety when the location of the nearest bathroom is a mystery. Your loved one might even start to feel helpless and begin to withdraw out of the fear of a public accident. Fortunately, there are some basic interventions that have been found to help reduce bladder wall irritation, which studies show can trigger the uncontrolled urinary urgency. For instance, try removing certain foods that are thought to cause bladder tissue irritation. Common offenders include citrus, caffeine, chocolate, and carbonated drinks. Also, make sure to drink an adequate amount of water. For most people, this means 6-8 glasses minimum. If your senior is craving something with flavor, try cranberry juice as some studies have shown it to soothe bladder tissue. But be aware of unhealthy strategies that many elderly implement in an effort for more bladder control, such as lowering their water intake. Limiting water intake makes for a temporary, and terrible, solution as it is a major contributing cause of urinary tract infection and urosepsis (the spread of the infection into the bloodstream). It is crucial that the senior drink enough water so that their urine remains dilute as doing so causes less irritation on their bladder. The likelihood of an infection is especially certain if your loved one is diabetic, has poor hygiene, and is not properly hydrated. The importance of your loved one remaining hydrated cannot be emphasized enough, so be sure that they are drinking 6-8 glasses of water daily. Clear pathways to bathroom: Make sure the path to the bathroom is clear of clutter. Falls happen when there is a mad rush to the toilet. Wear simple clothes: Simple clothes that are easy to get on and off is now more important than ever as every second counts. Wear adult diapers: Consider changing to disposable adult diapers for better urine containment as your loved one’s response to triggers of water running can cause urine to flow unstopped. Change disposable adult diapers at least every 2 hours. Consider a bedside commode: For an area or level of the home not near an existing bathroom, a portable or bedside commode may be a good option. Make a plan as to how it will be emptied and cleaned routinely. If it is also used for bowel movements, be sure to line the commode with a plastic bag for easy removal and reduction of odor. Stay clean: Use disposable wipes and keep skin meticulously clean. Use of a cream skin protectant is very helpful, but never as an alternative to careful skin cleaning. Stay calm: Encourage your loved one not to think about her urgency as she heads to the bathroom until she is totally situated on the toilet.This can provide a few extra precious seconds before the bladder muscles relax. Try limiting nighttime fluids after 6 pm, as lowering nighttime trips to bathroom reduce fall risks. If there is a nighttime caregiver to assist, consider making use of a bedside commode. Consider limiting the use of adult diapers to nighttime if full-nights rest is important and skin integrity wouldn’t be compromised. 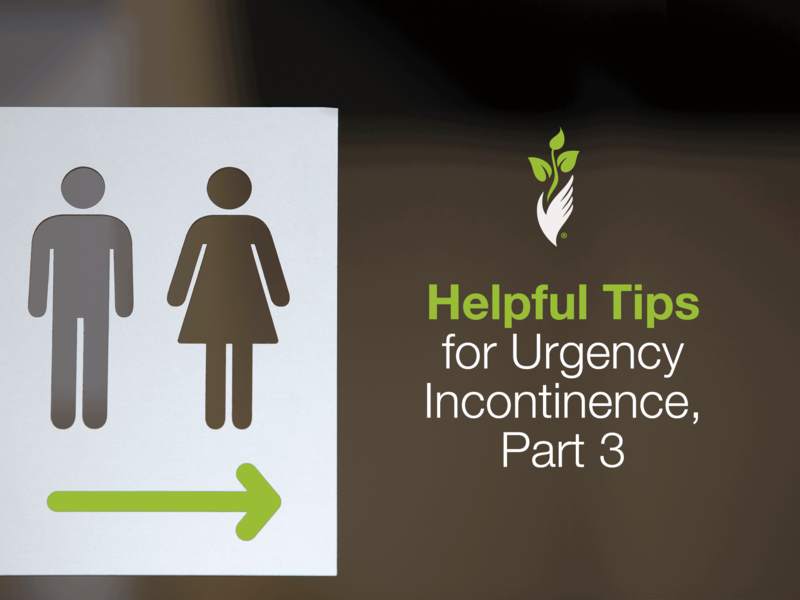 Read the complete urinary incontinence series on our senior care blog: Part 1 Understanding Urinary Incontinence and Part 2 Helpful Tips for Stress Incontinence.